It is hard to tell if this beautiful Claddagh Ring is simple in design but transparent of Irish heritage and significance history of the claddagh, heart encircled by pair of delicate hands with a crown above the heart. The hands of the claddagh symbolize friendship, the heart love, and the crown loyalty. . This Claddagh Ring is a fine representation of one of the world’s most beloved and easily recognized symbols of ‘enduring love’. 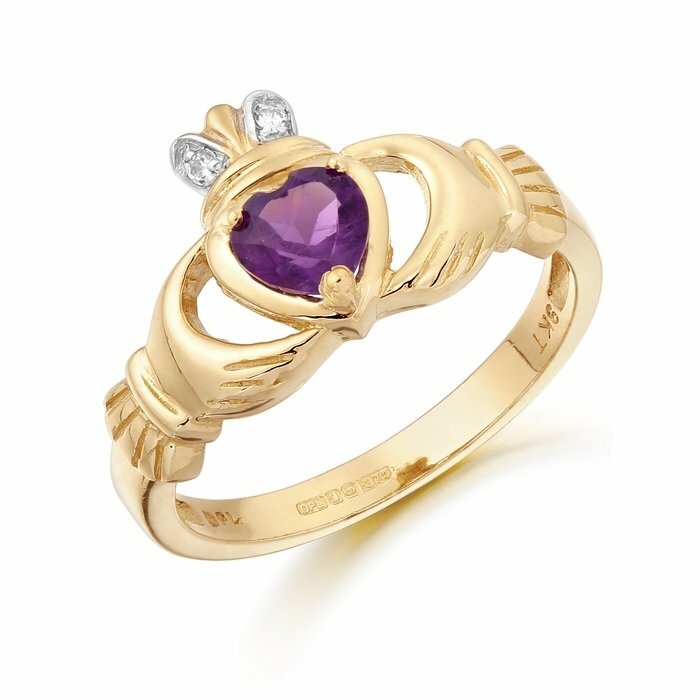 Our popular Claddagh Ring has a Cubic Zirconia Amethyst stone set in the 9K Gold heart with two small, cubic zirconia settings on either size of the Crown. This Claddagh Ring is made of solid 9K Gold with thick solid band making it a durable piece of jewelry with excellent craftsmanship. One can’t help but adore the beautiful Irish craftsmanship in it’s simplest but elegant form. Share these sentiments with someone important in your life with this shiny high polished finish, beautiful and excellent quality Claddagh Ring.